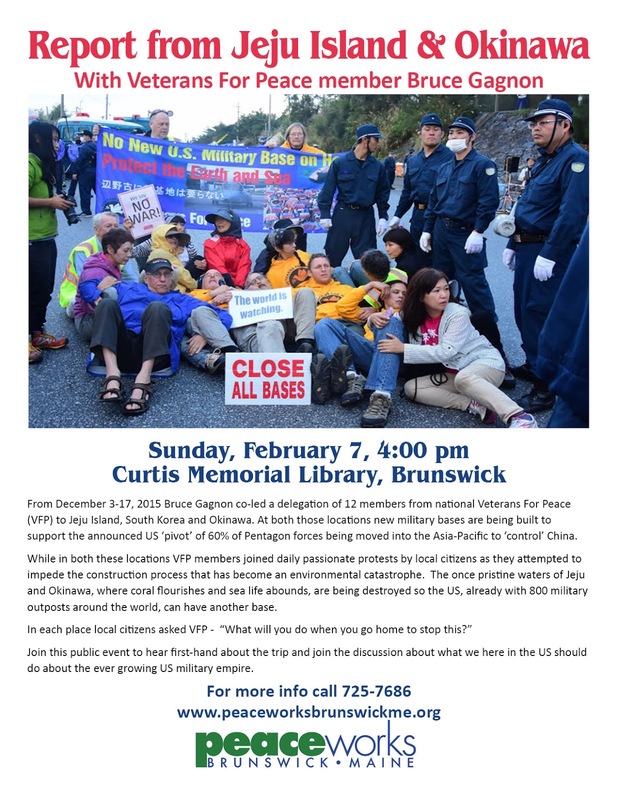 I traveled three hours north to Blue Hill, Maine on Thursday along with VFP national board member Tarak Kauff who co-led our delegation to Jeju Island and Okinawa last December. We were invited to speak at an event there that also featured fellow VFP members Dud Hendrick and Russell Wray - both of whom came on that same trip to Asia. It was exciting to see the others again and our collective presentations came across well - we got good reviews from those in attendance. In a small way it helped us honor our promises on Jeju and Okinawa that we would go home and spread the word. God knows we need to do more as the US clearly is moving toward war with China and Russia. Tarak and I had to drive back to Bath in a snow storm taking us 4 1/2 hours to make the return trip. The roads were so bad that he delayed his return home to Woodstock, New York and stayed the night here. Fortunately for me Tarak come outside and helped me shovel the mounds of snow, twice, having bragged that he had a great shoveling technique. I didn't see alot of impressive technique but he did help move the snow out of the way and that is all that counts in the end. We are now beginning planning to take another group of veterans and other activists to South Korea next summer. At the end of July we plan to join the annual peace walk all around Jeju Island and then we'll go to the mainland for meetings with South Korean activists, protests at other US bases, as well as other exciting events. Let me know if you would be interested and I will send you more information.